Feb. 11, 2015, 6:14 p.m.
By Joellen Easton Feb. 11, 2015, 6:14 p.m.
Editor’s note: Spot.us, funded in the second ever Knight News Challenge back in 2008, was an early innovator in crowdfunding journalism. 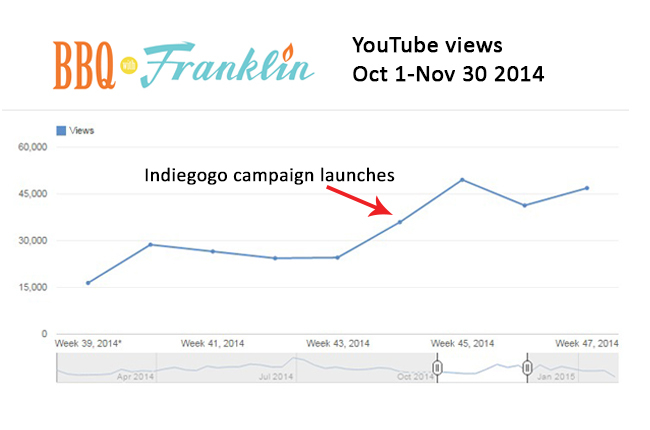 Think Kickstarter before Kickstarter. But despite its early start, it seemed to lose momentum, with projects growing fewer in number. In 2011, it was acquired by American Public Media, which wasn’t quite sure what to do with it. APM did an evaluation that tried to better understand the crowdfunding-for-journalism world in 2015. This, written by APM’s Joellen Easton, is the fruit of that process, which injects numbers and analysis into what sometimes has been an airy discussion. The things that didn’t work about Spot.us’ back end were significant, and it would not be possible to scale the platform or improve the user experience without completely overhauling the code base. Doing this would be expensive, and given the other crowdfunding options that are available to journalists today — both general interest and journalism-specific — it became clear that we could not offer a fundable service that would benefit audiences, journalists or public interest media more than what already exists. Most Spot.us projects were funded by friends and family, as opposed to community members with an interest in or a need for that information. The majority of Spot.us funders gave once and never returned. The market for crowdfunding journalism projects in general, as based on actual donations, is tiny, accounting for just 0.13 percent of the $2.8 billion raised in FY2013. It helped to have a BBQ celebrity whose advice is widely valued, Robertson added. But viewers also appreciate — and regularly comment on — the relevance and helpful nature of the videos. “They teach their sons how to [make BBQ], using the videos. To me, that is the purpose of public media: to provide educational, great content that betters families.” The series is available on KLRU.org and is coming soon to TV. WFPL ran a successful campaign on Kickstarter in spring 2013 for “Unbound,” a new program focused on short works of fiction. The station slightly exceeded its $4,000 goal with contributions from 150 backers. For the 70 backers who were already members of the station, the Kickstarter donation was an additional gift and didn’t reduce subsequent gifts. Is the program/content very specific and well thought-out? Does the program/content have an engaging and relevant purpose for target audiences? Plan and set pre-promotion activities/target. 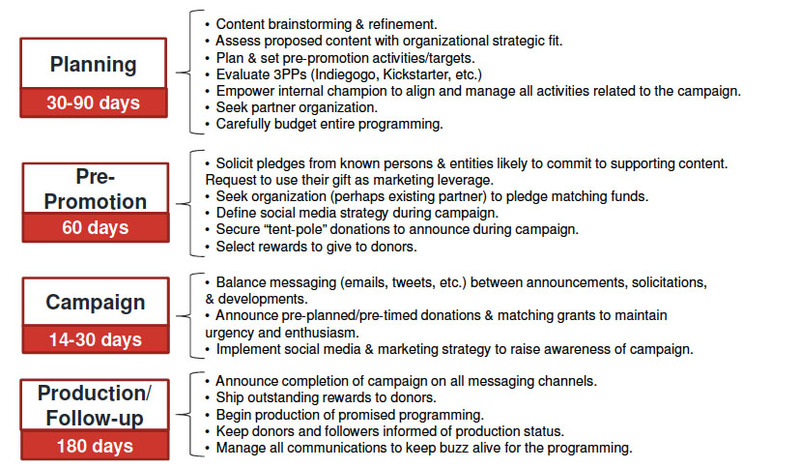 Evaluate crowdfunding platforms (Indiegogo, Kickstarter, others). Solicit pledges from known persons and entities likely to commit to supporting content. Request to use their gifts as marketing leverage. Seek organizations (perhaps an existing partner) to pledge matching funds. Balance messaging (emails, tweets, etc.) between announcements, solicitations, and developments. Announce pre-planned/pre-timed donations and matching grants to maintain urgency and enthusiasm. Implement social media and marketing strategy to raise awareness of campaign. Also published at the Public Insight Network. POSTED Feb. 11, 2015, 6:14 p.m.
Easton, Joellen. 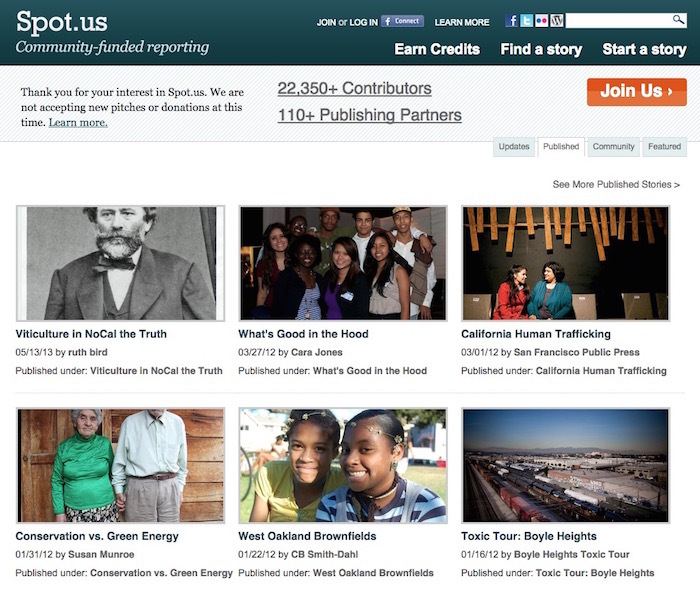 "Here’s a recipe for successfully crowdfunding journalism in 2015." Nieman Journalism Lab. Nieman Foundation for Journalism at Harvard, 11 Feb. 2015. Web. 18 Apr. 2019. Easton, Joellen. "Here’s a recipe for successfully crowdfunding journalism in 2015." Nieman Journalism Lab. Last modified February 11, 2015. Accessed April 18, 2019. https://www.niemanlab.org/2015/02/heres-a-recipe-for-successfully-crowdfunding-journalism-in-2015/.